SYDNEY (AP) — Byeong Hun An was having a mediocre round at the Australian Open on Friday, at least until the 15th hole. The South Korean golfer’s 7-iron on the par-3, 180-meter hole hit the green, bounced twice and rolled into the hole, taking him from a stroke behind the leaders to one in front. He finished the day in a tie for the lead after two rounds. An said he didn’t pay any attention to the distance. He shares the lead with Australian Max McArdle, who shot 66. An finished with a 3-under 69 to move to 8-under under going into the weekend at The Lakes and a one-stroke lead over Matt Kuchar, amateur David Micheluzzi and Jake McLeod. Kuchar and McLeod shot 67s, and Micheluzzi carded 69. An, who was 1-under at the time of his ace, thrust both arms in the air when the ball rolled into the hole, then broke into a big smile. 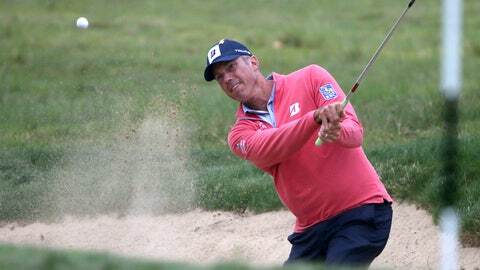 Kuchar won last week’s PGA Tour event in Mexico, his first victory in four years. He shot 70 in his first round in windy conditions. Keegan Bradley shot 66 and was among those tied for sixth, two strokes behind. An, meanwhile, should be able to keep better time after his ace. He won a watch worth $14,000. “It’s my third (hole-in-one) and the first one with a prize,” An said. The Australian Open is the first qualifying tournament for next year’s British Open at Royal Portrush, with the top three players not already exempt earning spots. Kuchar and Bradley are already exempt.